But there’s awesome fishing closer than you might think. Look out your back door and chances are there are virtually untapped fish to be caught. All you have to do is push farther away from the bedlam of boat launches and community holes. In a word: explore. Make adventure part of your fishing. Get intimate with the waters where you live, whether rural or urban. The perfect vehicle? Fishing machines like the Old Town Predator 13, Predator MX, or Predator XL Minn Kota. Need proof? Watch Old Town’s David Hadden and Steve Stracqualursi from 12wt.portage their Predators through woods, and silently slip into the riffles and runs of Maine’s Kennebec River. A gorgeous paddle far from the madding crowd, and they’re seemingly light-years from any other angler, like stepping back in time. See, it’s not just about fishing, it’s also about getting there. And no watercraft makes it so easy and fun. 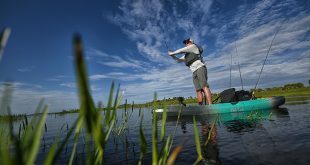 Speaking of the journey, now anglers can access even more hard-to-reach fish-holding waters across the globe … Old Town’s Predator XL Minn Kotabrings power to the equation, bridging the gap between fishing kayaks, bass boats and shallow water skiffs. This Ultimate Fishing Machine allows complete hands-free navigation and trolling via a full 45lbs of thrust with variable speed control and Minn Kota’s Digital Maximizer technology for full-day motoring. A true industry first, now anglers can get to fish-filled waters easier, faster and have more control once they get there. Not to mention silently motoring back to base camp when your arms and shoulders are sore from hours of epic fishing!